The use of ginger in foods dates back to early Asia where it was a common component in many edibles used as ancient medicine. 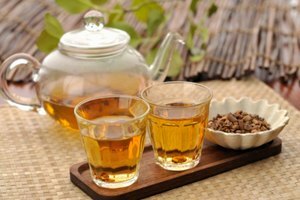 From there, its use spread and ginger became a common household remedy for stomachache, gas pains, indigestion and motion sickness. Piquant and delicious, it eventually made its way to the spice shelf and became a favorite flavoring additive of its own accord. 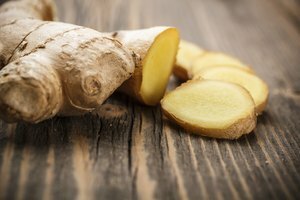 One of the easiest ways to store ginger is in a dried and ground form. If you happen to have extra on hand, or if you inadvertently purchased more than you need, drying the root on your own is a rewarding task that can result in many flavorful dishes in days to come. Wash the ginger root. Peel it carefully to remove the outer skin without damaging the underlying root. Slice the ginger, making slices between 1/8 to 1/4-inch thick. Try to make the pieces the same in both size and thickness to ensure uniform drying. Place the slices on a wire rack. Be sure to arrange the slices so that no two pieces are touching. Pat the slices with a dry paper towel to remove any excess moisture. Then place the wire rack inside the oven. Set the oven to its lowest setting and leave the oven door cracked open a bit. If necessary, roll a piece of aluminum foil into a oblong pipe and wedge it between the oven and the door to keep it propped open. The goal is to maintain an internal oven temperature of 130 to 140 degrees F.
Bake the ginger for 10 to 15 hours, turning slices over every 3 hours, or until the ginger slices are dry. Speed the drying process by grating the ginger rather than slicing it. Spread the grated ginger over wire screens or baking sheets and place in the oven as directed. Remove dry ginger from the oven and allow the pieces to cool completely. Keep dry ginger in plastic food storage bags or airtight, moisture proof containers for up to one year. Take advantage of the sun if you live in a hot, dry climate and dry your ginger with solar power. Elevate your baking sheets and place them in a sunny location. Cover the food with screens and let the sun to the work. Bring the food in overnight and repeat the following day, if necessary. This method is not recommended if you live in an area that regularly has relative humidity higher than 60 percent or temperatures of less than 85 degrees F.
To make ground ginger, place the desired quantity of dried ginger in a spice grinder or coffee mill. Use as directed in the recipe of your choice. 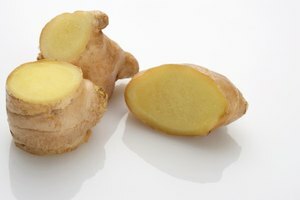 Dry ginger makes a nice addition to cookies, muffins, quick breads or teas. If you plan to dry a large quantity of ginger, a commercial food dehydrator might be a wise investment.